Action began as soon as the pits opened for Free Practice 1, everyone flooding out of pit lane. The session got off to an unfortunate start for Hector Barbera (Avintia Racing) who lost the front of his GP14.2 on his out lap at Turn 2, forcing him to jog back to the pits. For the rest of the field the session progressed without major issue, a ground temperature of 32°C providing almost ideal working conditions. 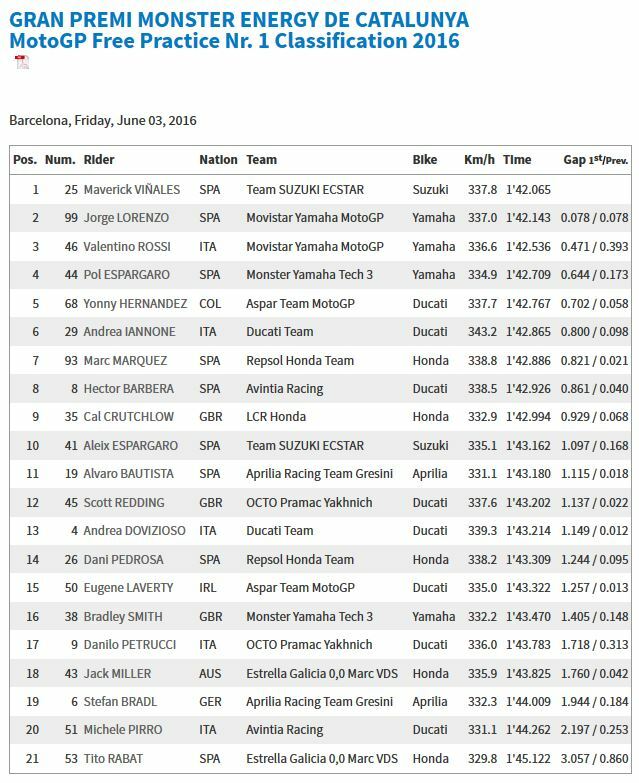 Of particular note was Jorge Lorenzo’s (Movistar Yamaha MotoGP) early pace, the Mallorcan dipping below the circuit record with a 1’42.143 on his fifth lap. The standings looked set in stone until Maverick Viñales (Team Suzuki Ecstar) exploded into action and set a 1’42.065. This put him 0.078s ahead of Lorenzo, who was unable to improve on his early time. Valentino Rossi (Movistar Yamaha MotoGP) completed the top three with a 1’42.536, ensuring all of the top three were within half a second of each other. Both Rossi and Lorenzo have had their third engines of the year officially withdrawn after the problems in Mugello. 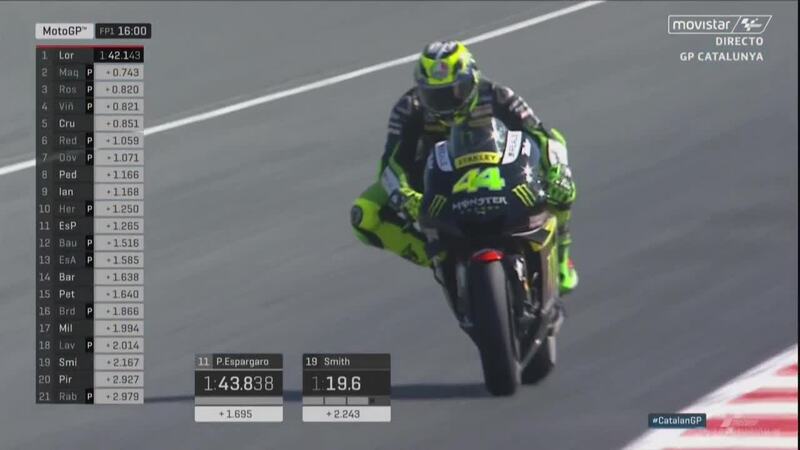 Pol Espargaro (Monster Yamaha Tech 3) was the fastest Independent Team rider in fourth, just in front of Yonny Hernandez (Aspar Team MotoGP) who surprised many with the fifth fastest time. Hernandez was the fastest Ducati of the first session with Andrea Iannone (Ducati Team) in sixth. 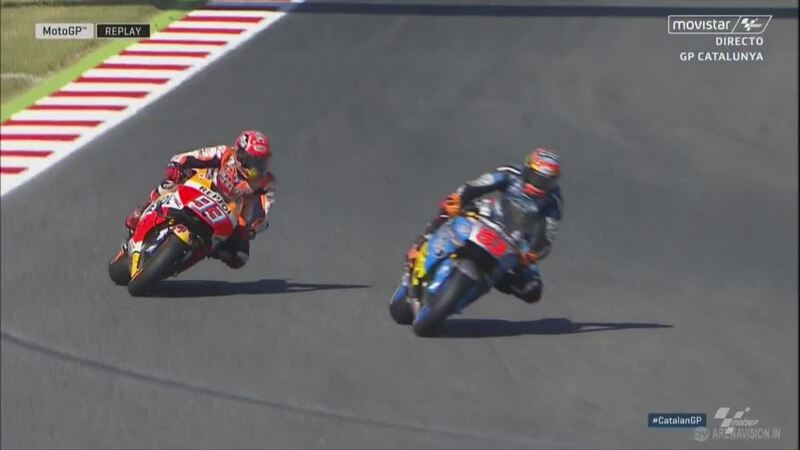 Honda riders found the going tough with Marc Marquez (Repsol Honda Team) struggling down in seventh and 0.821s slower than Viñales. Teammate Dani Pedrosa (Repsol Honda Team) had a similarly tough session, finishing down in 14th. Jack Miller (Estrella Galicia 0,0 Marc VDS) was another victim of Turn 2, crashing with 20 minutes left. Danilo Petrucci (Octo Pramac Yakhnich) suffered a fast off at Turn 4 in the dying minutes of the session. He, like Miller, was unharmed. Loris Baz (Avintia Racing) will miss the weekend after his foot injury sustained in Mugello. Tito Rabat (Estrella Galicia 0,0 Marc VDS) was also injured in Mugello, fracturing his left collarbone in FP3, but was back out with the World Championship after successful surgery. He ran without painkillers, setting the 21st fastest time. Rabat was another rider to fall at Turn 2, but he walked away unharmed.